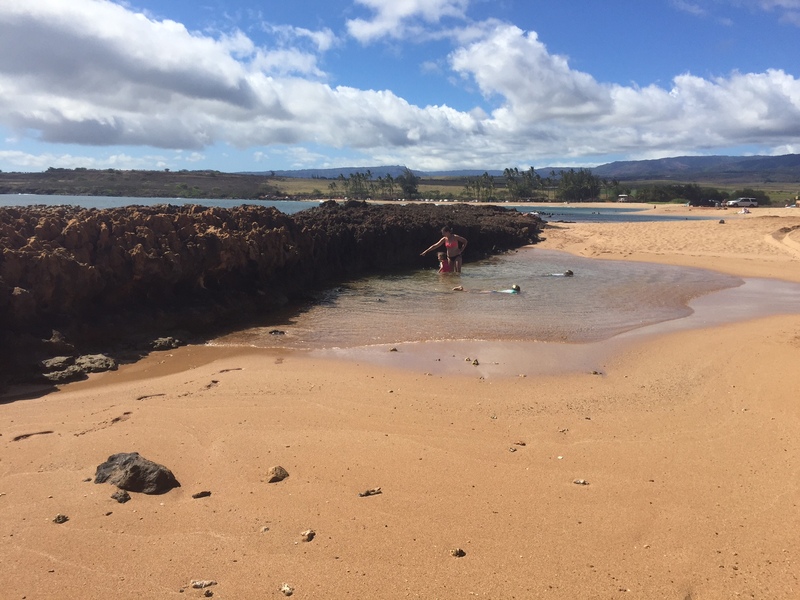 Salt Pond State Park on Kauai Has It All! As a parent with young children, it’s often a challenge to find quick day-trips that can entertain a wide-range of ages (in my case, 6-12). But, on our recent trip to Kauai, I think I may have stumbled on just that! Thanks to my job as blogger-extraordinaire (OK, just blogger), I was able to research a few places BEFORE heading over. So, we saved an afternoon to visit Salt Pond State Park, a place I thought MIGHT be a good place for families with children who have short attention spans. In a nutshell: I was right. Few Visitors: I can’t speak for weekends, but on the weekday we visited, there were just a few random families playing in the surf and relaxing on the beach. Only about half the stalls were filled when we arrived, and not many folks showed up after we hauled our gear to the beach. Seeing as this is one of the prettiest beaches on Kauai, I couldn’t figure out where everyone could be! 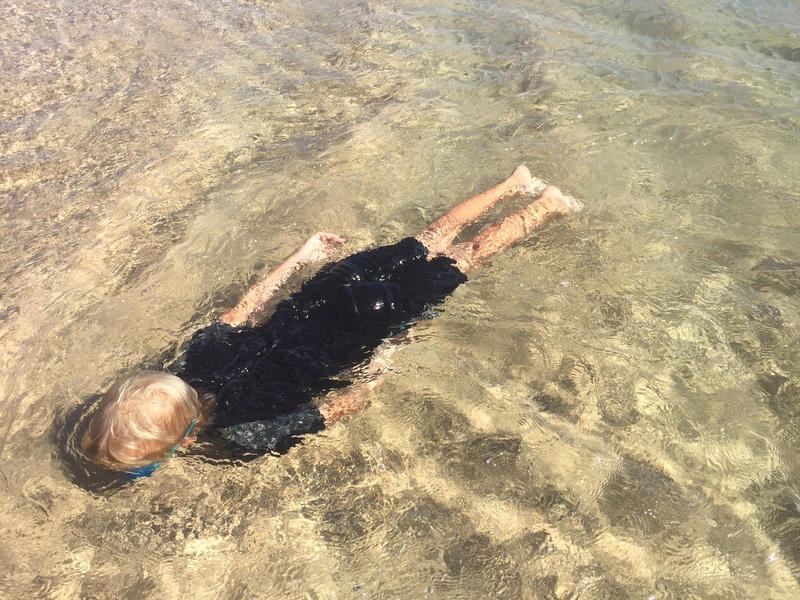 The water is calm at Salt Pond State Park, perfect for young children. Tons of Beach: There are few things more disappointing than lugging all your supplies to the beach — only to find there isn’t much beach, at all! That’s NOT the case at Salt Pond State Park on Kauai. In fact, the gently sloping beach was expansive and looked even more spacious considering only a handful of families were there. The tide pools are small enclaves connected to the larger beach. Gentle Waves: Even though Tropical Storm Darby had moved through the islands when we were there, the water at Salt Pond State Park was gentle and calm. That makes it ideal for little swimmers or anyone who isn’t confident in the water. The swimming area is protected by a reef, so it’s unlikely you’ll find unruly waves here. And, the reef extends into the swimming area, providing great opportunities for snorkeling. The ocean here is perfect for young body boarders or those looking to learn, too. On the day we visited, we even saw a boxer “boxing” the waves for practice! Lifeguard Station: In the event of an emergency, you’ll be glad to know there is a lifeguard station on-deck. For hygiene “emergencies,” there is a restroom, too. In addition, you’ll find showers and picnic tables right there. Tide Pools: Tired of swimming and want to play with some sea critters? Just walk (or drive) around to the east side of the park, and you’ll find a series of tide pools, many of which are quite large and interesting. We found lots of little fish to look at, but also a few larger ones by the lava rocks. And, speaking of lava rocks, if you walk near or on-top of them, you’ll find some of the neatest rock formations and colors (we found bright red rocks that were incredible to look-at). 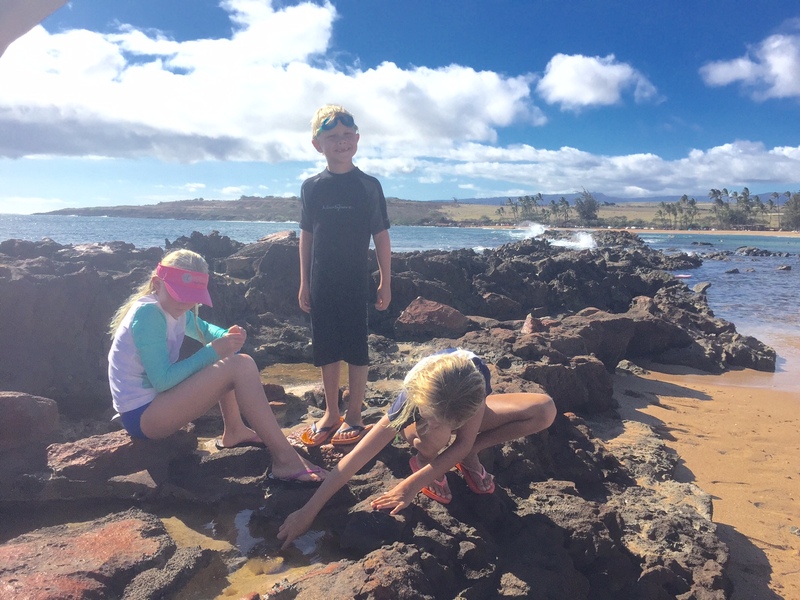 The lava rocks at the tide pools are great places to explore different formations. A Bit of Culture: Hawaiian families have evaporated seawater in the pans dug out of the red soil here to produce natural sea salt during the summer months. The salt is bagged and used for cooking and as an Epsom salt-like medicine and offered plain or mixed with red clay. Hawaiian salt is available at some markets on the island. I’ve heard that, around 5 p.m., you may even get to see some of the salt collectors come t their saltpans and collect. We didn’t see any that day, but we were gone by 4:30 p.m. 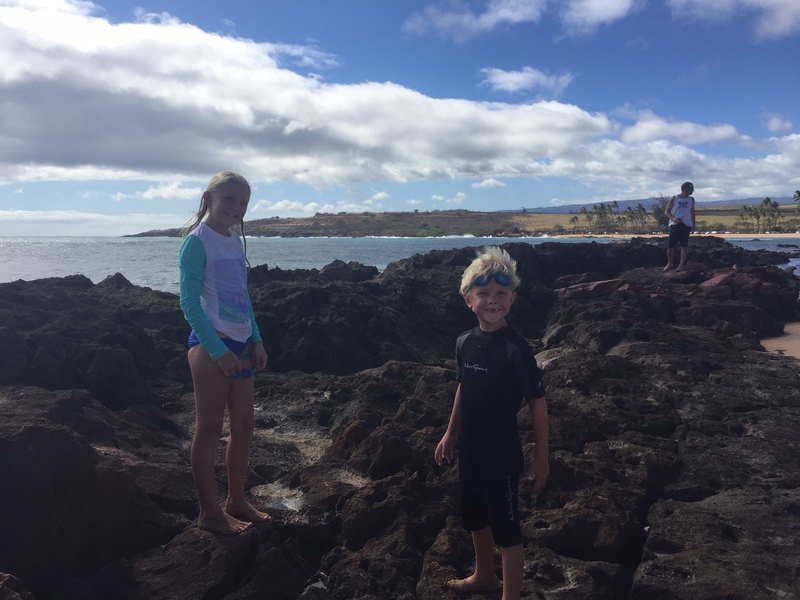 The tide pools are perfect for young children who want to snorkel and search for cool sea creatures. 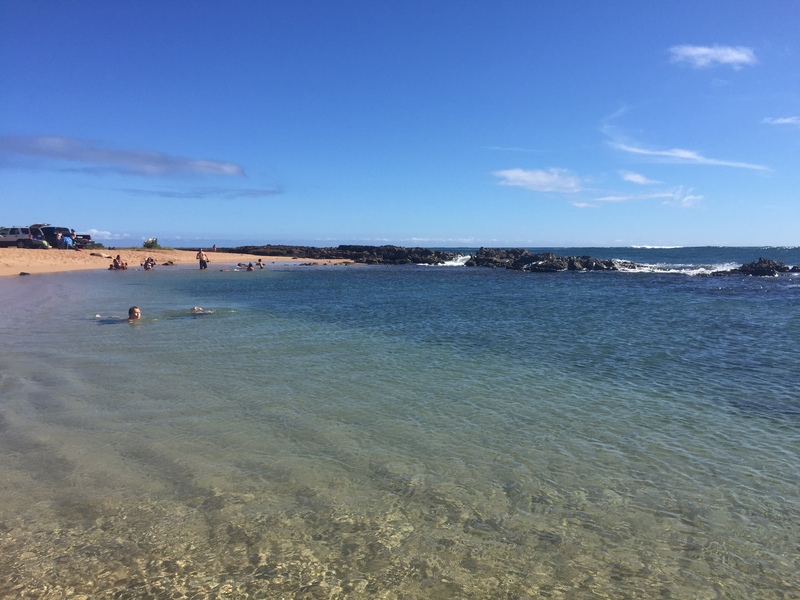 Salt Pond State Park is only a short drive from Poipu, one of the most popular visitor destinations on Kauai. Or, you can ask your tour professional to stop-by when you book a Kauai Jeep Tour, which offers tours of Waimea Canyon and Spouting Horn. From my experience, Salt Pond State Park on Kauai great side-trip, especially if you have small children to entertain!